Third volume of Card's Tales of Alvin Maker (most recently Red Prophet, 1988), set in an alternate America where magic works (people have "knacks") and a fledgling US peacefully coexists with various Crown Colonies, republics, and independent Indian nations. Alvin returns to the town of his birth, Hatrack River, to take up his apprenticeship with Makepeace the blacksmith; he will also, finally, meet Peggy, the "torch" (she reads people's futures, among other things), who has been Alvin's secret protector since his birth. Alvin hopes she can teach him the art of Making. But Makepeace turns out to be a harsh and mean taskmaster; worse, Peggy has disappeared (she loves Alvin, but can foresee nothing but disaster for them as a couple). 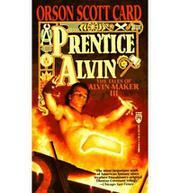 Alvin, then, learns to extend his powers greatly, but does not yet discover what he needs in order to become a Maker. After various complications involving slavery (still institutionalized in the South), Peggy returns to Hatrack River magically disguised, to be the town schoolmarm. Alvin, furious with the unyielding Makepeace and inspired by the schoolmarm's gentle guidance (he still doesn't know who she really is), mingles iron and magic to craft a golden plow that, in some eerie fashion, seems alive. Finally, Alvin and Peggy reveal themselves to each other, then part once more, as Alvin--now secure in his knowledge of the art of Making--realizes that his true vocation is to teach the art to others. Another thoughtful, involving, immensely appealing yarn, bubbling with folksy charm: Alvin shows no sign of running out of steam.